Modern Greek is the language that Greeks currently speak. The Greek language is in general an independent branch of the Indo-European family of languages. It has the longest documented history of any other language of the same family and 34 centuries of written records, so surely, this is a huge legacy for all of modern civilization to keep and to enrich. Today, Modern Greek is the official language both in Cyprus and the Republic of Greece. It is also spoken by Greek communities, spread all over the world, known also as the Greek Diaspora (Διασπορά in Greek is equivalent with the dispersion). Modern Greek does hold a special importance in the financial, scientific, philosophical, political and linguistics fields. it is not though a currently international language and due to its difficulty it is a rare choice as a second language. Modern Greek is ranked 61st according to the number of native speakers, but is quite widespread due to the Greek Diaspora, as there are Greek communities in almost every industrialized country. We can trace also massive indigenous communities in Egypt (Alexandria), south Albania, Turkey, Russia and Ukraine, Romania, Italy, the U.S.A, Germany, Spain and France. SO, WHY LEARN MODERN GREEK? 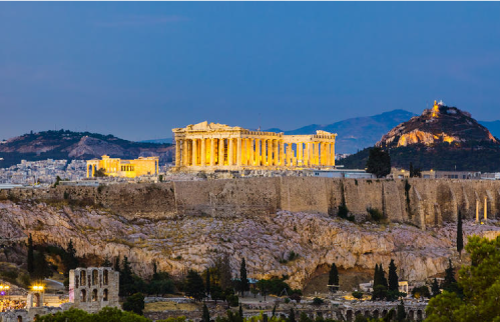 A genuine interest in the outstanding richness of the Greek culture and civilization is always a good first reason to pick up contemporary Greek. The literary importance of the Greek language cannot be denied and many people learned Greek for academic reasons. Still, a vast variety of Greek words have been widely borrowed into other languages, in fields like mathematics, astronomy, philosophy, medics etc. Greek word elements in common with Latin words are the foundation of the scientific and technical modern vocabulary, meaning also that many people already know Greek words of great importance if they speak any European language! Ancient Greek, firstly, is not the same language with Modern Greek. They share a common history of 2.500 years of development, evolution, linguistic change etc. They are not intelligible between each other, and they are used in a different way, for different purposes. Ancient Greek and Latin compose the heart of the Western civilization, not only linguistically speaking. Besides the fact that they influenced almost all parts of the known world of the antiquity and their language, the foundations of all sciences were firstly represented and demonstrated in Greek and, later, in Latin. As Latin was created based completely on Ancient Greek, these two languages remain different but still share a unique commonplace. These two classic languages are currently offered for educational purposes mainly, in all levels of secondary / high school, as well as in higher education (Bachelor, Master, phD etc). Languages such as Sanskrit , Latin , Classic Arabic and Ancient Greek are all very essential for a deeper understanding of cultures’ past, history, behavior and existence. Want to meet Theodoros? Go to ‘Find a tutor’ and fill in Theodoros’ name. WHICH IS EASIER TO LEARN: DUTCH OR GERMAN?